Written and directed by Ed Harris who also stars in this movie, Appaloosa is set during the late 19th century and revolves around Virgil Cole (Harris), a lawman who has been hired to defend a small town from a rancher named Randall Bragg (Jeremy Irons). Reminiscent of Wyatt Earp, Cole’s deputy Everett Hitch (Viggo Mortensen) is also along for the ride as they attempt to restore order to this town held hostage. Eventually, Cole succeeds in restoring order to the town with the arrest of Bragg, however when a mysterious woman named Allison French (Renee Zellweger) arrives in town and challenges Cole’s and Hitch’s outdated law keeping techniques, this creates some soul searching questions for Cole. Of course, everything is not as it seems in this clever Western drama that follows one man’s journey into a new era that boasts some wonderful acting by Harris, Mortensen and the extremely talented Jeremy Irons who is perfectly cast as the nefarious and Randall Bragg. Best of all, Appaloosa is an extremely realistic Western that easily allows the viewer to become fully immersed from the great on-screen relationship of Harris and Mortensen to Zellweger as the outspoken women to challenge their old fashioned values, Appaloosa comes together extremely well. Apart from the well written story based on the novel, the movie features some wonderful cinematic moments with a great almost oil panting colour palette that although may not be the most exceptional transfer to Blu-ray, it almost has a period feel to it. Needless to say, great image quality and deep coloured blacks. The Dolby TrueHD 5.1 track really comes into its own when the gunfights start which boasts crystal clear dialogue and a memorable soundtrack. 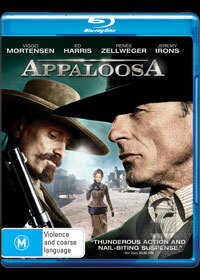 For lovers of special features, Appaloosa comes with audio commentary by writer/direct/actor Ed Harris and co-writer Robert Knott which is a mixture of interesting and unfortunately a little tedious at times. Even so, a great insight into the minds of both men and the creation of the movie itself. It also features some deleted scenes, a short featurettes entitled Historical Accuracy that goes into the props and sets of the movie, Bringing the Characters to Life, another featurettes that talks about the casting, The Town of Appaloosa, the creation of the set of the movie and finally Dean Semler's Return to the Western which gives the viewer a unique perspective of the cinematography of this movie from sets, lighting and the like. At the end of the day, it’s good to see another Western movie and best of all, it’s a well made movie that proves this genre doesn’t haven’t to be stereotypically clichéd and can tell other tales as well.